The Striiike brow guru and VIOLET FILES columnist on tweezers, Cara Delevingne, and her favorite beauty haunts. In the post–Cara Delevingne era, strong brows are an essential element of every woman’s beauty look. But eyebrow artist and VIOLET GREY contributor Kristie Streicher has been perfecting the full-brow effect since Delevingne was in diapers. A favorite of A-listers like Rachel Weisz and the Olsens, Streicher forged a niche in the market after the ‘90s Pam Anderson line-drawn brow left many of us in a tragically overplucked state. Now, L.A.’s beauty-savvy denizens seek out Streicher for her Eyebrow Rehabilitation program (she prohibits clients from plucking for three to four months before appointments). She has even trademarked her signature Feathered Brow. Here, Streicher answers VIOLET GREY’s burning beauty questions. 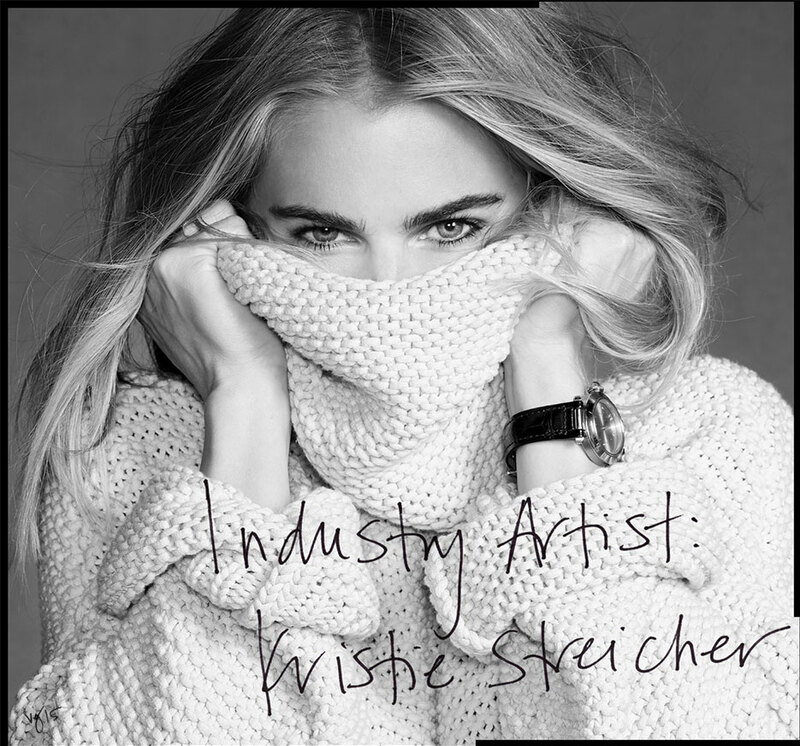 Kristie Streicher answers our questions and reveals her secret spots—brows and beyond. Private Pilates sessions with Ashley Hoffman at Equinox. I have tried every exercise known to man, and I’ve found that doing Pilates twice a week has helped me to feel stronger, taller, and leaner. Eighties Brooke Shields on the set of a shampoo commercial. Such a gorgeous set of brows and a full head of hair. Rubis Tweezers. These Swiss-made tweezers are hands down the best-made and sharpest on the market. Rubis also makes a great cuticle scissor that is perfect for trimming brow hairs, and offers a great tweezer- and scissor-sharpening program..
ROHTO eye drops. They immediately brighten and awaken the eyes, and their hint of menthol is tingly and refreshing. Although I’m not as talented as a manicurist, I enjoy doing my own weekly manicures and collecting beautiful products to make them last. I love Tom Ford and Butter polishes. My sister Ashley at Striiike. She not only knows me and my hair, so she’ll give me a cut that I can style easily—I don’t like to fuss. She taught me not to overwash my hair, and when I do wash it, to avoid brushing and to let it air-dry for the best natural texture. I really love Biba DeSousa in West Hollywood. She does microneedling, which is like a great workout for the skin. It really improves the oxygenation and tone. ZIIP, a sweet little hand-held DIY device that I believe will change a lot of lives. You program it from your iPhone, and its nano currents provide the same kind of benefits you get from a light facial treatment. I love Dandelion Ranch and the new floral delivery service BloomThat. They put together a simple selection of the best flowers available and deliver when and where you want in less than 90 minutes. Aforé Oil. It’s the perfect lightweight oil—rich in Vitamin E and great for any skin type. I created it to use before tweezing, but also it works well as a moisturizer, cuticle oil, and beard oil for men. Eating and sleeping well. I try to get at least 8 hours of sleep every night. I eat everything in moderation, but I never shame myself for indulging, whatever it might be. I would be a florist or someone who works with plants...some sort of living plant artist. Elizabeth Taylor, Audrey Hepburn, or Marilyn Monroe, just to hear their stories, and Kim Kardashian. She’s such a pretty woman, and I would love to see her with a more natural look, a makeunder, if you will. I think she would be great with softer angles, especially her eyebrows—she needs a Feathered Brow. “Enjoy the good times.” When things get tough, “This too shall pass.” I find it extremely helpful knowing that time heals and softens everything. My sister Jenn was instrumental in my beauty career—she helped me get my first job at the beauty counter. But it was the lack of eyebrow experts that fueled my interest in this field almost 20 years ago. Do what helps you to feel good about growing older because we all age and we all will die one day. And people will judge you either way. Striiike because it really is the coolest. Hvar, Croatia. I love the people and the food and especially the Adriatic sea because of the extreme saltwater—you can float and be weightless. An at-home massage from Phoebe Diftler, Thai Massage Therapist. Joey Carrera at Sally Hershberger salon. Eyes, then EYEBROWS, of course! DO YOU SEE THE PERFUME BOTTLE AS HALF-EMPTY OR HALF-FULL? Get the sisters’s date night ideas for where to go and the beauty products to wear there.